The smart choice for the ultimate in coastal protection. Simonton understands that residents of coastal areas want the best impact protection available against strong storms and high winds. That’s why ECOstorm windows and patio doors are designed to be extremely strong. Plus, they’re constructed of premium vinyl to achieve excellent thermal efficiency. They require almost no maintenance providing years and years of energy savings. Approved for all Gulf and Atlantic coast regions including Miami-Dade and Broward County Florida. ECOstorm windows and doors lead the way in proven impact performance. Their durability starts with double-strength glass that’s laminated so it is able to withstand high winds and flying debris without the need for plywood or shutters. Profiles made of remarkably sturdy premium vinyl are then reinforced with steel. The result is a line of impact-resistant windows and doors so impressive they can even survive stringent building codes. ECOstorm windows and doors are different. Their premium vinyl is inherently an excellent insulator. Unlike other materials, such as aluminum, which conduct energy easily, vinyl does not. When combined with a double-strength, laminated insulating glass unit, our vinyl windows and doors are truly superior in helping a home retain cooled air, regardless of outside temperatures. ECOstorm windows are available in a variety of styles, along with coordinating Patio and Garden Doors. 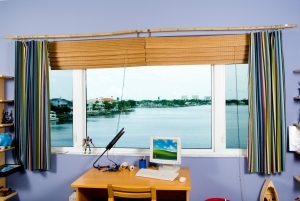 All products are available with an assortment of glass and grid options typically associated with traditional windows. Their attractive vinyl profiles are designed to complement virtually every architectural style, with classic lines and a rich appearance that reveal little of their formidable strength. And their beauty will not fade, even in harsh conditions. Best of all, they require virtually no maintenance. Don’t let hurricane season get you down!